Tangled and True: mairzey dotes. There is nothing better than a company you already know and love coming out with something new. Mairzey Dotes has just introduced their new line of bibs and burps (which are amazing), they were already among my favorites in the blanket department with their vintage modern feel and super soft backing, but when I saw the new line I was thrilled. The fabric combinations are perfect, the design incredible and they have officially been added to my "next baby" collection. I love them. If you've yet to discover their blankets you are really missing out. They are among some of my favorite fabrics, paired together perfectly. In my experience you can never have too many blankets and these are at the top of my list. "They are made in the U.S.A. and are machine washable, because as a mom, I know there are some things that just cannot be "fashion before function." Simple design. Colorful prints. Modern. Vintage. Luxury. Today Mairzey Dotes is giving one of you the chance to fall in love with their collection. 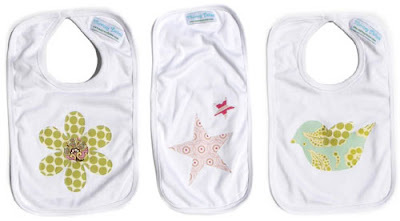 One winner will receive the bib and burp set and a blanket of their choice. Now the only problem is how you'll ever decide. note: winner must contact me by Monday (6/30) 8 am in order to claim their prize. these burp cloths and blankest are really cute. i would choose the paisley bird or green stars for the bibs and burps set and the paisley dot or mocking bird blanket. i really like the look of the fabric designs. my name is naomi witcher. Very cute, hard to pick! Burps I like the green star or either of the birds, blankets I like the paisley dots and cabana stripes. i've been eyeing this website, and these blankets and bib sets are absolutely on my 'next baby' list, too. i choose the paisley bird bib/burp set, and the paisley dot blanket. tough tough choice. my name is holly montano. The Oopsie Paisley is just too cute! Paisley dots and green stars. These are so cute! Thanks for sharing. 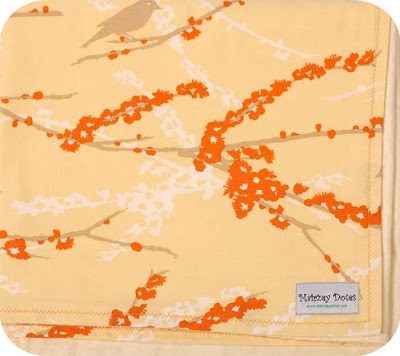 I love the Paisley Bird bib and Mod Yellow Dots Blankie! Thanks! The green stars bib/burp cloth and the reversible polka stripe yellow blanket would be fabulous! I love the dotty bird or the green star set! So cute! Perfect for my little boy that's expected to come in the next couple months! Love it! I would have to choose the mockingbird, it's feminine and not pink, plus my husband loves orange and really wants to name our daughter Scout. For my husband's sake...pick us! I like the mod pink dots in the receiving blankets and the pink dots flower bibs and burps. So many cute designs to choose from! For a boy I love the doggy, and a girl the dotty bird, and mockingbird prints. Ooooh I love the cabana stripe and the dog print blankets--so cute! LOVE the designer doggie set! Would love to have the beagle bib/burp combo for our sweet 6 week old bebe! We have two beagles here at the house - definite dog, baby and fashion lovers!! I love the paisley dots. My 2 year old would fight over the D is for Doggie with his baby brother. I love the Mockingbird print for the blanket and Paisley Bird bib--so fun thanks! The designer doggies are adorable! Since I'd never actually own a dog...this would be great for our soon-to-come baby boy! I love the paisley bird bib and burp set and the paisley dot blanket. Super cute!! I like the paisley bird bib, and the mockingbird blanket. SO adorable! I love the paisley bird bib and the mocking bird blanket. Or any blanket with paisley on it. I love the D is for Dog blanket and the dog burp and bib set. Love the styles. I like the Green Star Burp Cloths and the Mocking Bird Blanket. You're right ... how to decide?! But love the Paisley Dots for the blanket, I'm pretty sure, and the Paisley Bird for the bib ... too cute! I love the mockingbird blanket and the paisley bird set. These are some of my FAVE fabrics! Great giveaway! I like the paisley bird print. It would be cute for baby #2! I'm lovin the paisley dots and the dogs! so cute. The "mockingbird" blanket is really cute, and I love the "Green Stars" bibs & burps set. dottie bird and the lottie dottie blue blanket. so SO cute! We are a family with a HUGE boy dog, two boys (almost 4 and 19 months) and boy #3 coming this sept, so we have to go with the dogs for the bibs and blankets all the way! How to decide they are all so cute! Love the birds, love the paisley, love the design. I love this stuff! For the blanket, I'd pick the Mockingbird. Burps/Bibs, I'd go with the Paisley Bird design. Thanks for sharing! I like the pink dots flower bib/burp set, and the mod pink dots blanket! I would choose the bib in "Green Stars". It has a subdued and modern quality about it that is perfect for a little designer in the making! I am a sucker for anything with birds! I am in love with the bird bib and I love the mod yellow blanket. So adorable. I think my favorite is the Polka Stripe Pink. Although how could you go wrong. I love the Mod dot...in Pink. Those blankets look so cozy and the fabrics are so darling!! I like the Paisley Bird style. They are all so cute, but the Paisley Dot Reversible blanket is my favorite! I love all things paisley (bird and dot). So cute! I love the paisley bird bib and burp set. The mockingbird blanket is gorgeous! I like the D is for dog set. So cute! Yes, very hard to choose! I think I like the Paisley Dot blanket and the Paisley Bird bib and burp designs the best. I love the fabrics. Im into the birds lately, so I would choose the paisley bird bib and burp and the gorgeous mocking bird blanket! These look so soft. I'd choose pink stars for the bib/burp and cabana pink stripe for the blanket. Thanks! I like the paisley bird and paisley dots. Its all great though, I wouldn't be picky! afdr3d@umkc.edu - I'm Alice Hansen. The green stars set is my favorite...I just love paisleys and can never have enough bibs and burp cloths. Thanks for sharing! Oh, I love the pink mod dots, and the pink dot flower set... so cute! I love the Paisley Dot pattern! SO cute! I really like the "Lottie Dottie Pink" pattern!! it's to drool for is my favorite! I like the dottie bird for the bib/burp set. I adore the Paisley Dot or the Paisley Bird designs! i love the mockingbird blanket! orange is such a great color and not often seen among the stacks of baby blankets. as for the bibs, i love the paisley bird and the green stars. LOVE that mockingbird receiving blanket! hope it's me! Love the Pink Stars Bibs & Burps set and the Mockingbird Receiving Blanket. Great selection. ok these are really SO cute!!! thanks so much for introducing!! :) for the bib/burp i would choose Paisley Bird and for the blanket Paisley Dot!! :) they are so beautiful!!! I like the Dottie Brid bibs & burps set and the Paisley Dot blanket. mockingbird blanket and paisley bird bib...all too cute! They are sooo cute, I would choose the D is for Dog blanket and the Designer Doggies bibs and burb set. The Paisley bird bib and burp cloth and the Mockingbird blanket are my favs!! So cute! I like the 'Oopsie Paisley' blanket and the Pink Dots Flower bibs and burp clothes. I realy like the paisley bird bib and burp cloth and the "Don't Eat the Paisley's" blanket. Hope to win! I love the paisley stripe receiving blanket, cute site!! Cool find! I love the Paisley Dot blanket and the Paisley Bird bib. We like the Dottie bird! I am in la la LOVE with the dottie bird. does it get any better than this....i think not! I love the Designer Doggies burp set and D is for Dog blanket!!! I like the paisley dots. My daughter would love the D is for Dog but my favorite would have to be Mockingbird. How will I choose? Pick me as the winner and find out! I like the "Don't eat the paisley" blanket and the polka dot bird bib. Everything is super cute though! i love "made ya look," even though it says it's for boys. "buy you a mockingbird" is also pretty dope. isadora would look so sweet in either of these styles. I love all the paisley dot collection! Super cute and fun! I'd love to win! I'd pick the paisley bird and the cabana stripe blanket. I would totally get the paisley bird and paisley dot blanket to match! They are adorable! I LOVE the paisley dot and the strip, but the animal print is cute too! I love the designer doggies....so cute! I would love to win! I'm having a hard time deciding between the Mockingbird and D is for Dog. They are both great and so different! HELP! !...I love them both! Cute items! I would choose either of the birds for the bibs and the "D is for dog" for the blanket! Oh how fun to get to dream of what it would be like to have my pick....I would choose the polka stripe pink or yellow and the birdie bibs. Who dreams up all these adorable little must haves... I've fallen for them. The It's To Drool For Set is lovely. I am in love with the mod pink dots blanket and the pink dot flowers for the burp set. Great product. Thanks! Forgot to leave my name- DeAnna! I like "D is for Dog"! Very cute! Pink dots fower is cute. Thank you so much for this giveaway. I really love the "D is for Dog" pattern the best. This is so adorable. Thank you and please enter me. Absolutely love the Made Ya Look blanket, and the Dottie Bird burp and bib. So cute! Oooo..the dottie bird bib with the paisley/dot blanket. Gotta have it! These are the cutest! I would choose the green stars for the bibs and burps set and the mod yellow dots for the blanket. They are all just great! My name is Charity Lister. these are soooo adorable. I definitely like the bird for the bib and the Mod pink dots blanket. SO CUTE! I think I would choose the green stars for the bibs and burps and the paisley dot or mod yellow dot blanket! I love that these folks have created CUTE baby items - marriaging the fashion and function. Hats off to them. Not to mention the "Mairzey dotes" phrase is a VERY dear one to me in my family, so I love them already! I would choose the mod yellow dots blanket, and the paisley bird bib&burp (of course!). Cute! Forgot to leave my name (OOPS! )...Annie Webb! Such creative articles for infants. It is hard to choose as I have two grand babies due. However, I love the Pink Dots Flower Bib and the "It's to Drool For" Blanket. I would choose the Designer Doggies bib set in dachshund, because we have one. And the D is for Dog blanket, of course! I'd pick Paisley Bird for the bib and burp cloth and Mockingbird for the blanket. Love the green stars for the bibs, and the cabana stripe yellow blankets. Lots of good gender-neutral stuff. Hello! What adorable blankets and burp cloths! A wonderful prize package. I adore the vintage look of the "Please Don't Eat the Paisleys!" I like the Oopsie Paisley set. Too cute! So cute! I love the Green Stars for the bib and cloth and the Paisley Dot for the blanket. Wow, great designs! I love the Mod Pink Dots blanket and Pink Dots Flower Burps and Bibs. Cute, cute stuff! Cute! I love baby items with style. I would pick the paisley bird bib set and the mockingbird blanket. Thanks! I am in love with the paisley bird burpcloth and bib and paisley dot blanket!!! LOVE THEM! I really like the Green Dottie Flower for my girl, as a nice contrast to the pink we typically dress her in. Also, the "It's to Drool For" Vintage blanket is such a stand-out with its modern elegance & pairs well with the Green Dottie, too! Thanks for the giveaway! I love D is for Dog for my little man. Paisley Bird & Paisley Dot! D is for Dogs and designer dogs are my picks thanks so much. katie_mmartin at yahoo dot com. My name is Aubrey & I love the paisley bird & the mockingbird prints! My name is Nikiya Johnson. I would pick the pink stars bib and burp, and also the pink dots blanket. The star would be perfect due to my husband being in the US Army. Super, super cute!! I love the paisley dot set. Thanks so much! The Cabana Stripe and Paisley bird are fantastic designs .. seriously adorable. i like the green stars. my boy loves to urp. I love the vintage collection and the cabana yellow stripes! Oh but how to choose, they are all so lovely! I would pick Cabana Stripe Yellow, although all the patterns are very nice. The design I would choose is... for the blanket cabana stripe yellow; for the bib & burp set, I think it would be pink or green stars, because they are just so cute! These are adorable. I love the paisley bird bib and the Made Ya Look blanket. I'd choose the Paisley Dot blanket and the Dottie Bird bib and burp set---very pretty! Thanks for the contest. I like the Paisley Dots and Green Stars! D is for Dogs! Super cute for a little boy, love it!! The paisley bird bib, green stars burb cloth, & cabana stripe yellow blanket. These items are so precious! I love the Paisley Bird, very cute for my little man! My new little man would love the designer doggie beagle set of bibs and burb cloths and the the doggie blankie. He's only 2 months...but he's starting to talk and told me so. It's possible, no? Great blankets and burp cloths. blanket: Cabana stripe yellow, although, I have a pillow in the mocking bird print and I love the paisley. These are great!!! I love the paisley dots! Thanks! A paisley bib is CLASSY and the mocking bird blanket is the greatest!Talk about a million dolaar baby!!!!! Those are my favorites! All of the designs are so unique and adorable! The oopsey paisley is my choice. These are cute! I'd choose the bird design. What a great website! The blankets are adorable! I would choose the green stars bibs & burp set. For the blanket, i just love the mod yellow dots one! such a great modern look to it! Buy You a Mockingbird! It matches the fabric of my ring sling perfectly! So cute! I like the designer dogs bib & burp and D is for dog blanket. Great for a dog loving mommy and a baby boy or girl arriving in just 6 weeks! I am loving the oopsie paisley! Love the buy you a mocking bird!! I love the green stars for the bibs and burp set and then the cabana stripe or paisley for the blanket! Love them. I like the promise you the moon. These are so cute that it was hard to choose. I choose the Blue Chenille & Blue Dots design. For my nephew, he's coming to the world next month. It's really hard to choose actually. they're all adorable, but if i were chooosing some for my "next baby" i'd go with the yellow chenille and yellow dots. love it. I like the pink stars and the cabana stripe pink. Great giveaway, thanks! just added you to my google reader and what a pleasant way to start... so here goes my first giveaway entry. The Paisley Bird Bib is really cute (but it was hard to choose a favorite). i like the designer doggies. The Designer Doggies bib and burp set and the D is for dog blankie - too, too cute! I would choose the star bibs for my little own little star & the cabana stripes because he is such a darling manly man. I have two girlfriends that are expecting this summer and I know they would absolutely love these products. The pink dot flowers bib and mod pink dots blanket are adorable, but everything is so great that it is hard to choose! What beautiful things -- and yes, definitely hard to choose! My favorites I think were the It's Too Drool For Blanket, And The green dottie flower pattern for the beautiful bib and burp set! These would be so cute for my little dude! I definately love the vintage look of D is for Dog the best! I'd definitely choose the Dotty Bird bib set. The blanket is harder to decide on, but I think I'd go with the Yellow Cabana Stripe receiving blanket. I would have to say the paisley dots. Really cute! I'd like to collect them all but D is for Dog is the most unique baby blanket I've ever seen! Very cute! I love the little bird on the bib! For bibs and burps I like the green star and for the blanket I really like the paisley dot design. My nephew and his wife had a baby boy last week, this would be a perfect gift. Oopsie Paisley is absolutely adorable! I'm sending the website link to my DIL right now! I like the designer doggies, the beagle on the bib and then there is a doggie blanket. I would pick the pink chenille and pink dots. Everything is so cute! i like the oopsie paisley. I love the designer doggies and the d is for dog sets! Too cute!